At the end of every year, we here at YPT like to count down the top ten most memorable moments of the year that was. This year, in our continuing celebration of YPT heroes, we decided to honor the Top Ten Hero Moments of 2015! These are moments big and small, when members of the YPT family acted heroically or honored the heroes who inspire them. Want to be a #YPThero? There’s still time! Donate to YPT by December 31 and help over 2,000 DC-area young people realize the power of their voices next year. Thank you, and enjoy the countdown! YPT’s first event of the year was also one of our most powerful: Silence Is Violence: a #BlackLivesMatter Event. Held in the early days of the Black Lives Matter movement, this pop-up performance brought local students together with professional theater artists for a night of creative responses to the movement. In front of a capacity crowd at Capitol Hill Arts Workshop, these artists shared their profound, sometimes tragic and often uplifting feelings about racism and police brutality in America. The night ended with a space for community reflection and art-making! Thank you to all the YPT heroes who shared their voices at Silence Is Violence: a #BlackLivesMatter Event! For more, visit silenceisviolencedc.tumblr.com. Giving Back to the Future: YPT’s 20th Anniversary Giving Voice Award Gala was an event for the ages. Honoring NPR’s Diane Rehm, this Back to the Future-themed celebration brought DC philanthropists, theater artists and student playwrights together at The National Press Club for a night of eating and drinking, dancing and supporting young voices! Though Diane Rehm touched us all with her inspiring words, the night’s true hero was Evan Alston, a fifth-grade student at E.W. Stokes PCS. After reading an original poem he wrote about YPT, Evan donated his very own money to YPT at the live auction! That’s the mark of a true #YPThero! YPT’s 2016 Giving Voice Award Gala is Saturday, March 12, 2016, at the North Hall at Eastern Market! Honoring Shakespeare Theatre Co. Artistic Director Michael Kahn, the gala promises to be as exciting and fun as the last three. Tickets are now on sale: buy them online at yptdc.org/GetInvolved/GivingVoiceGala/! 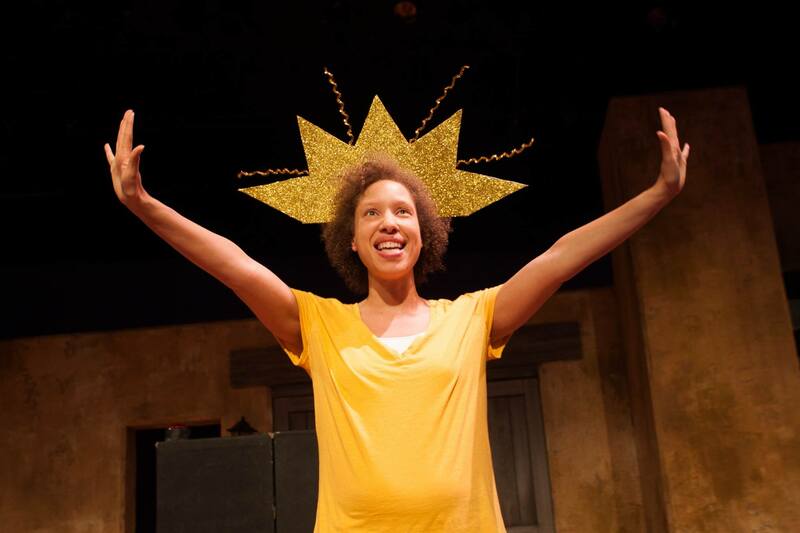 Among the many magical moments we saw at the 2015 New Play Festival, perhaps the most touching was seeing elementary school playwright Ja’Neza Andrews-Washington honor her serviceman brother through her play. Ja’Neza’s play, The Confusion of Being in the Army, is based off her brother’s experiences leaving home for Army boot camp. Her brother came to the performance and seemed to truly cherish his little sister’s tribute! Click here for information on YPT’s 2016 New Play Festival, which will be unlike any we have ever held before! Taking place over three weeks at three theaters around DC, the 2016 Festival will engage the larger community in exciting and innovative ways. Join us April 11, 18 and 25, 2016 for the new-look New Play Festival! Just before the 2015 New Play Festival, YPT received an exciting email from Curious Theatre Company in Denver, CO. Their Curious New Voices National Collective, a week-long summer intensive for promising teen playwrights, was set to begin, and they wanted a YPT playwright to attend! We invited Cardozo High School student Dominique Butler, whose stirring play we were producing in the Festival, and who had expressed an interest in continuing his playwriting education. Click here for photos from a recent reading of Who’s Next? at Cardozo, and stay tuned for more on the play in the new year! YPT says goodbye to one staff hero and hello to another! In August, YPT entered into a time of exciting transition, as long-time Artistic Director Nicole Jost left to pursue her MFA in Playwriting and we welcomed DC theater veteran Thembi Duncan onto our team as Creative Programs Director! Since joining YPT, Thembi has led her first in-school playwriting workshop and produced her first YPT staged reading: Girls Write Out!, our entry into the Women’s Voices Theater Festival! To rally the DC theater community around young women’s voices, Thembi also began our “What Happens When?” video campaign, getting contributions from across America—including one from Nicole, who remains a dear member of the YPT family all the way from San Francisco! Compilation video: What happens when a young person realizes the power of her voice? Celebrate the heroes who dedicate themselves to the arts: donate to YPT in honor of a staff member or theater artist! The dedicated young artists of YPT’s Young Playwrights’ Workshop and Student Advisory Council are used to taking on serious subjects in their work, but 2015 saw them tackle perhaps their most delicate issues yet: mental health and gun violence. The Young Playwrights’ Workshop’s 2015 original play, The Art of Understanding, delved into perceptions of mental illness through three powerful vignettes woven together with poetry and personal reflection. Written and performed by the Workshop’s teen artists, The Art of Understanding wowed the packed house at the Source Festival in June! In the fall of 2015, the artist-advocates of YPT’s Student Advisory Council contributed to a landmark event: the DC premiere of gun control play One in the Chamber. Council members wrote short plays in response to One in the Chamber, and two were chosen for a professional staged reading that followed the show’s closing performance on September 6. Congratulations to the current and former Council members who wrote such powerful, complex pieces! The Workshop and Council will be back with more performances in 2016: click here for the dates, and mark your calendars now! Two days before the 2015-2016 school year began, YPT staff and volunteers—including a great team from Acumen Solutions—met at YPT partner school Tubman Elementary School, to help get the campus ready for students to arrive. From spreading mulch in the garden to decorating display cases, the YPT family banded together to make Tubman an even more delightful place to learn. After the volunteer event, many gathered at Pete’s Apizza for a pizza party fundraiser supporting our work! In the two years since it began, YPT’s partnership with Tubman has grown so close that we recently decided to adopt the school, through DCPS’s Adopt-a-School program. Since the beautification event, we have assisted Tubman in improving their assemblies, and held a holiday clothing drive to support their homeless and low-income students! We look forward to many more years of partnership with Tubman. Thank you to YPT’s amazing volunteers and corporate sponsors for supporting our work and ongoing partnerships! YPT serves over 1,500 students with playwriting programming in 2015! YPT is proud and humbled to have served over 1,500 DC-area students with playwriting programming in 2015. Between our In-School Playwriting Program and Summer Playwriting Program, we reached young people ages 8-18 in all eight wards of DC, Northern Virginia and Maryland! Guided by our Dream Impact Map, in 2015 YPT continued to expand our programming in Wards 1, 7 and 8, where students have the least access to arts education. With a larger presence in high-need schools like Cardozo Education Campus and Anacostia High School, and new partnerships at Wheatley Education Campus, Kramer Middle School and more, YPT is poised to make a deep, lasting impact in the DC neighborhoods that can most benefit from our services! Help YPT serve even more young artists in 2016: make a tax-deductible donation today! DC Theater Rallies for Young Women’s Voices at Girls Write Out! YPT’s 2015-2016 performance season began with a bang, as Girls Write Out! packed the house at Shakespeare Theatre Company’s Harman Hall! Part of the Women’s Voices Theater Festival, Girls Write Out! featured the powerful voices of four young female playwrights. From the hilarious to the tragic, their words resounded through the DC theater professionals who brought them to life onstage! The performance concluded with a wonderful playwright talkback, led by YPT founder Karen Zacarías. Leading up to Girls Write Out!, some of the most celebrated women in the DC theater community contributed to our “What Happens When?” video series, sharing their thoughts on what happens when a girl realizes the power of her voice. Even Shakespeare Theatre Co. Artistic Director Michael Kahn, YPT’s 2016 Giving Voice awardee, got in on the action, delivering a powerful address before the show! YPT heroes help SAVE arts education during Hero Week! In the wake of Girls Write Out!, YPT realized just how many amazing heroes we have in our lives: our students, our teaching artists and actors, our Board of Directors, our volunteers and the entire YPT family. In honor of those heroes, we launched Hero Week, a celebration of the heroes our young artists create and the heroes who make YPT great! Our goal for Hero Week was to raise $5,000 to support our students in 2016. Instead, thanks to the over 125 YPT heroes who donated that week, we raised nearly $6,500! With a match grant from the Cafritz Foundation, that money immediately doubled to over $10,000. But we’re not done yet: our goal is to raise $25,000 by the end of 2015, with every dollar going directly into the classroom. Click here to donate, and help bring a young person’s voice to life in the new year! Thank you, YPT heroes! We love you all!